Encontre seu guia perto da Praça de São Marcos e aprenda sobre a história da cidade enquanto se dirige para a antiga casa dos Doges de Veneza, que governou "A Mais Serena República de Veneza" por mais de mil anos. Fique no centro do gracioso pátio, onde você pode ver duas escadarias espetaculares que levam aos andares superiores. Aprenda sobre os senados e conselhos que determinaram o destino da cidade nas Câmaras Institucionais, e veja o impressionante lado da Câmara do Grande Conselho, uma das maiores salas da Europa. Observe o Renascimento e o rico detalhamento maneirista, depois fique ao pé das grandes estátuas de Marte e Netuno de Sansovino, que representam o poder veneziano na terra e no mar. Siga os passos de prisioneiros condenados enquanto atravessa a Ponte dos Suspiros do século XVII até uma antiga prisão e aprenda sobre os homens que estavam trancados na prisão original infame, incluindo Casanova, que fez uma fuga ousada. Termine seu passeio no Palácio dos Doges, que é conveniente para o transporte público e alguns dos locais mais importantes da cidade. I wish I remembered our guide's name but she was amazing! She was very knowledgable and spent time explaining so many historical facts and highlights of the palace. The palace itself is very beautiful but our experience was enhanced because of the tour guide. Highly recommended! We toured the Doge's palace with a very knowledgable guide and got to skip the long line. I wish I remembered our guide's name but she was amazing! She was so knowledgable and spent time explaining so many historical facts and highlights of the palace. The palace itself is exquisite but we got so much more out of it by having a guide. Very worthwhile tour and fun. Our guide Francesca was great, but we got off to a rocky start due to poor instructions on where to meet, how to exchange our voucher for tickets, and rude staff at the ticket kiosk Alilaguno. The skip-the-line part was mostly the case at the Doge's Palace itself, but there was a long line at the kiosk to exchange vouchers. 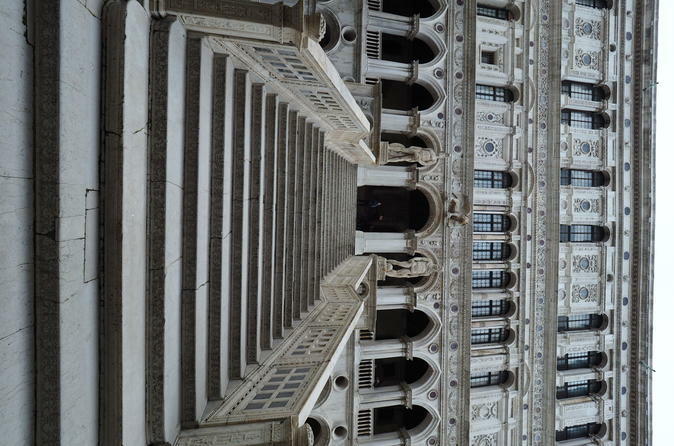 The tour itself was entertaining and informative, and the Doge's Palace is a must see in Venice. However, we would recommend finding a different tour operator with a better record on customer service. Tour guide was exceptional, unfortunately the man in the kiosk where you redeem your paper tickets was extremely rude to everyone, especially us, and definitely needs a change of career!!! A bad start but the tour was amazing and our guide was so informative and very funny. 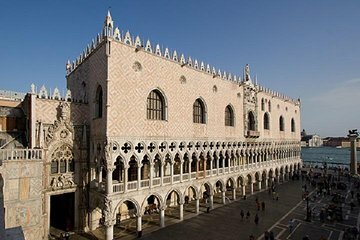 The Doges Palace is beautiful and so full of amazing dramatic history. A must do tour, if you can through unscathed at the ticket kiosk!!! Beware!!! The tour was great. It was a bit difficult to find the meeting place because it was a very crowded in the morning and we didn't start at Doge's Palace. But customer service was very helpful and we eventually found our place. The time was also different. Viator listed it at 11 and the tour actually starts at 1115. Our guide said her company has mentioned this to Viator a couple of times. Since my friend and I was running to get to the meeting place it worked out well. We ended up with a personalized tour because another couple didn't show up, and once we got started, we discovered it was better just with the two of us any way. On the flip side, our tour guide kept getting asked questions by other people touring the Palace. A little annoying but she handled like a pro and wasn't rude to us or them. All and all I would definitely recommend the tour. So when the tour Guide is 20mins late for the start of the tour and you then fimnd yourself behind 10 other large groups and have to wait for a further 15 mins to enter it defeats the purpose. Our guide was fabulous. She was polite, took our picture and was very informed. Our guide is very knowledgeable and answers all questions. She even give us tips where local eat and other places to shop and must try. Very informative and recommended. Gave on 4 stars only because our tour guide was a bit condescending when asking questions or making statements he did not approve of. The others on the tour did not show up, so we had a private tour of the Palace. Our guide was very knowledgeable and accommodating. One in our party could not handle the stairs, so our guide was able to take us on a route that reduced the steps as well as gained access to the elevator, which we may not have figured out ourselves. The Palace was beautiful and impressive.